In 2000, Lawrence Lerner and the Thomas B. Fordham Foundation reviewed state science standards in 49 states and the District of Columbia, specifically with respect to the coverage of evolution. We repeat his survey for all current standards publicly available as of May 2009 and discuss the history and role of state science standards in American public education. Our survey indicates that science standards tend to cover evolution more extensively than they did a decade ago, and that the average quality of the treatment has increased. However, certain types of creationist language are also becoming more common in state standards. We also discuss the history and role of state science standards in American public education. When it comes to state science standards and evolution, we at the National Center for Science Education sit up and take notice, for there is perhaps no other arena in which the religious controversy surrounding evolution plays out to such a detrimental degree as in the generation of poor science standards. Local and state control of education can lead to state science standards that reflect political and religious agendas, rather than good pedagogy and strong science. Texas is an excellent example, where recent amendments to the Texas Educational Knowledge and Skills (TEKS) document now require the presentation of creationist claims about the complexity of the cell, the completeness of the fossil record, and the age of the universe, despite calls from over 50 scientific and educational societies to support accurate science education by adopting the science standards as originally written by scientists and educators on the writing committee (Simon 2009). Any study of biological, earth, and space sciences must place evolution in its rightful place, as “the foundation of modern biology” and crucial to fields as diverse as agriculture, astronomy, computer science, engineering, geology, and medicine (A Message to the Texas State Board of Education 2009). Yet, in Texas and around the country, the inclusion of evolution in state science standards continues to be challenged and marginalized. But does it matter? Do science standards actually play an important role in curriculum, science education, and scientific literacy with respect to evolution? And if so, how do states measure up? The USA has a long history of preferring local over state control of education. By the early 1980s, however, reports clearly indicated that the USA was falling behind other nations in educational benchmarks, and in particular, science literacy. In A Nation at Risk: The Imperative for Education Reform, the National Commission on Excellence in Education (1983) called for strengthening public education by implementing higher expectations, specifically recommending “schools, colleges, and universities adopt more rigorous and measurable standards.” Since then, all states and the District of Columbia have acquired some form of state science standards. National organizations have also chimed in, offering model standards. The American Association for the Advancement of Science founded Project 2061 in 1985, publishing two significant works to guide scientific literacy: Science for All Americans (American Association for the Advancement of Science 1989) and Benchmarks for Science Literacy (American Association for the Advancement of Science 1993). The National Research Council’s (1996) National Committee on Science Education Standards and Assessment also developed National Science Education Standards in 1996. The process of generating state science standards varies from state to state. Often, the state department of education assembles a committee of scientists, teachers, parents, and others to write and/or revise earlier standards. In some cases, state school boards get involved in the process, as occurs in Texas, which has the unfortunate effect of placing elected officials, with little or no knowledge or expertise in the fields whose curricula they govern, responsible for approving standards written by experts. In theory, states seek to adopt standards that represent what scientists and practicing educators deem important for scientific literacy. For example, with respect to evolution, Skoog and Bilica (2002) make it clear that science standards should “emphasize evolution in a manner commensurate with its importance in understanding the natural world and our place within it.” In practice, however, the coverage of evolution in science standards can be less than adequate, not because the topic is scientifically controversial but because officials either have a specific religious agenda or don’t want to “ruffle creationist feathers” (Lerner 2000). According to Lerner (2000), standards are “meant to serve as the frame to which everything else is attached,” forming the foundation for curricular activities and driving “standards based” educational reform (Lerner 2000). For example, California has curriculum frameworks and instructional materials designed specifically to provide guidance for implementing the content standards. There are websites, such as Understanding Evolution (http://berkeley.edu/evolution), that allow teachers to search for lesson plans that correspond to particular sections of their state’s science standards. Statewide exams administered at specific grade levels are also designed to reflect state standards. For example, in New York, the Regents Examination in Living Environment is designed to provide a measure of “students’ attainment of the New York State Learning Standards in Science, as defined by the New York State Learning Standards for Mathematics, Science, and Technology.” Finally, publishers shape the content of their textbooks according to the standards of some of the larger states (Lerner 2000), even issuing special editions for use in the larger states such as Texas, California, and Florida. The Texas edition of Holt Biology, for example, features the state reptile (the horned lizard, Phrynosoma cornutum) on its cover and contains “Texas BioWatch” boxes that “describe scientific research being carried out in Texas today”; the teacher’s edition, moreover, provides information about how the content connects with the TEKS and the Texas Assessment of Knowledge and Skills (TAKS) tests (Johnson and Raven 2004: xvi). Unfortunately, even if state science standards accurately reflect the central role of evolution in biology, there is no guarantee that evolution will be taught effectively. Moore (2009) noted that supposedly state science standards are the basis for what teachers teach and students learn and thereby establish the foundation for states’ desired education outcomes. However, Moore also found little correlation between good science standards, particularly with respect to evolution, and instruction in evolution by biology teachers. Regardless of how a state measures up with respect to the inclusion of evolution in the state science standards, the percentage of teachers believing that creationism should be taught in science classes in public schools varies little (Moore 2009). Comments like “evolution is indeed difficult to teach in my biology classes…due to the lack of scientific evidence for many of its claims” are made by teachers even in states with strong science standards. Good science standards do not seem to be correlated with good science teaching. We therefore return to the primary question: Are standards really that important and/or effective when it comes to improving evolution education? Does it really matter, for example, that some states describe evolution only as “change through time” rather than as descent with modification from a common ancestor? The answer is “Yes.” Even if a good treatment of evolution in state science standards does not guarantee that evolution will be taught well, it provides a critical resource for teachers who want to teach evolution correctly. The clearest example is that a good treatment of evolution in the standards provides important support for biology teachers facing protests from creationist students, parents, and administrators who want creationism taught, or evolution not taught, in life science courses. However, it is also an important support for combating two other problems, experienced by many science teachers who contact NCSE for advice: parents who want their students to be able to “opt out” from evolution-related lessons and creationist teachers of non-science subjects who attack evolution in their own classes. Both of these phenomena have the same educational impact as attacks on or omission of evolution in science class; they leave students ignorant or misinformed about evolution. However, administrators often deal with the latter situations differently, reasoning that if science teachers are not actually being prevented from teaching as they deem appropriate, it is best to keep everybody happy by allowing creationist students to opt out and other teachers to criticize evolution if they want to. 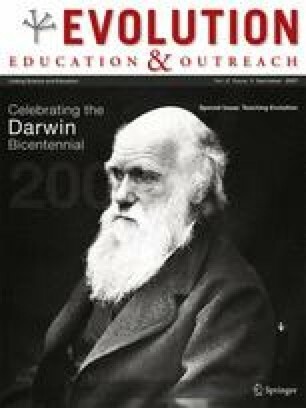 A good treatment of evolution in state science standards can help to persuade administrators that the teaching of evolution is not a matter for political negotiations between parents and teachers with different interests but a clear educational necessity. Students simply should not be allowed to opt out of material that the state considers essential (Scott and Branch 2008), and non-science teachers should not be allowed to contradict or undermine this material in their own lessons. So how is evolution faring in today’s state science standards? There is, thankfully, no explicit requirement that creationism be taught or evolution not be taught in any of the state science standards currently in force. However, that is not altogether comforting, for in general, over the last two decades, creationists have reduced their advocacy of state-level legislation and policy that explicitly endorse creationist claims or attack evolution. Blanket bans on evolution and policies requiring “balanced treatment” of evolution and creationism have given way to more innocuous language, such as “teaching the controversy,” “critical analysis,” “strengths and weaknesses,” “academic freedom,” and “discussing the full range of scientific views” (Branch and Scott 2009). This is doubtless largely because such attempts have been obstructed by the courts at every turn, but it also reflects a growing creationist understanding that such legislation is not necessary to accomplish many of their goals in the public schools. Most creationism advocates in America are members of like-minded communities, which provide them with ready access to any amount of antievolution material—textbooks, articles, and video programs. Hence, there is no need to recycle or even refer specifically to this material in government policies. An antievolution policy need merely implicitly permit such material to be taught, and creationist pressure at the local level will often ensure that it is taught. Indeed, creationist legislators themselves have frequently made this point. In 2004, the first “academic freedom” bills were introduced in Alabama; Senate Bill 336 and House Bill 391 would have permitted teachers “to present scientific, historical, theoretical, or evidentiary information pertaining to alternative theories or points of view on the subject of origins.” No explicit mention was made of creationism or any standard creationist claims. Nonetheless, a sponsoring state representative explained that “Evolution is one theory, creation is an alternative theory,” while the lead senate sponsor said that his bill “allows a teacher to bring forward the biblical creation story of humankind.” (Montgomery Advertiser, February 18, 2004). Similarly, the original text of 2008’s Louisiana Science Education Act (enacted as Louisiana Revised Statutes 17:285.1) encouraged teachers to “help students understand, analyze, critique, and review in an objective manner the scientific strengths and scientific weaknesses of existing scientific theories pertinent to the course being taught.” Elsewhere in the bill, evolution was listed as one such theory. In the finalized bill, this was trimmed to “help students understand, analyze, critique, and review scientific theories in an objective manner.” The sponsoring senator explained that this act would permit the discussion of “scientific data related to creationism” (Hammond Daily Star, April 6, 2008). To many Americans, this seems harmless or even laudable—why shouldn’t students practice evaluating the scientific theories they study? Of course, the answer is that students should do so—but only in a way that will in fact promote their understanding of science and that is otherwise pedagogically responsible. In the case of Louisiana, there is certainly reason to think that, on the contrary, evolution will be invidiously singled out for attention and that creationist critiques of evolution will be used. When Louisiana’s Board of Elementary and Secondary Education adopted a policy about what types of supplementary classroom materials will, and will not, be allowable under the new law, a draft provision that “materials that teach creationism or intelligent design... shall be prohibited from use in science class” was deleted (Rosenau 2009). The aspiration to have middle and high school students evaluate evolutionary theory, moreover, is not entirely realistic from a pedagogical perspective. Students should evaluate the scientific theories they study—but not before they fully understand those theories! As the foundation to the entire science of biology, evolutionary theory is vast and complex, resting on a variety of evidential bases from a number of scientific fields—all of which students are generally being introduced to for the first time in high school. Students will not finish learning about it in detail until, at minimum, their later years of college, and they will not begin seriously analyzing it and synthesizing their knowledge until graduate school. Expecting high school biology students to be able to evaluate evolutionary theory is no more reasonable than expecting high school physics students to evaluate quantum field theory. If students had the necessary knowledge and skills to make such judgments, there would be little reason for college science courses! Thus, the language we classify as “creationist jargon” is pedagogically unsound in and of itself, gives license to the use of creationist teaching materials, and is known in several cases to have been introduced by creationist legislators and policymakers for precisely this purpose. State science standards have been formally reviewed twice, by Braden et al. (2000) and Gross et al. (2005). Lerner (2000) also provided a comprehensive evaluation of the treatment of evolution in state science standards, as did Swanson (2005), following a different methodology. Many states have revised their standards since the publication of these reviews. Using Lerner’s (2000) criteria (Table 2 Appendix), we re-evaluated and graded all state science standards (or comparable documents—see Table 3 Appendix for a complete list)—in all 50 states and the District of Columbia specifically on their inclusion and coverage of evolution; and we report results here (Table 1, Fig. 1; and Table 2 Appendix). Human evolution has been dropped. Despite specific reference to evolution in PreK-8 framework, there is no mention of age of the earth, fossils, Big Bang theory, plate tectonics, etc. Improvement on treatment of biological evolution. No human evolution. Forty-seven states and the District of Columbia have revised their state science standards since Lerner (2000), with only California, Nebraska, and New York still working with standards written before 2000. Twenty-four states have revised (or are in the process of revising as is the case with Colorado and Minnesota) their science standards in the last four years. The good news is that, in our re-evaluation, nine states and the District of Columbia receive a grade of A, indicating that the treatment of evolution is excellent or very good. Five states, however, fail in their treatment of evolution. In these cases, the treatment of evolution is absent or made useless by the inclusion of creationist jargon and/or disclaimers. The remainder of the states are more equally distributed: 16 states score in the B range, 14 score in the C range, and only six in the D range. Our survey indicates only 11 states total have standards with unsatisfactory treatment of evolution. A comparison of current grades with those assigned by Lerner (2000) appears in Table 1. Fourteen states and the District of Columbia show some improvement in their state science standards with respect to the treatment of evolution. Twenty-five states showed no change in their grades from 2000. Five of these received grades of D or worse, and perhaps more importantly, each made revisions to science standards in the intervening years since Lerner (2000) published his report indicating each state’s unsatisfactory or failing treatment of evolution. Ten states show a decline in their grade, in most cases because specific and clear treatment of human evolution was either omitted or dropped from the standards. In following the criteria set out by Lerner (2000), we evaluated the inclusion of not only biological evolution but also geological evolution, cosmology, and treatment of the connection among the life, earth, and space sciences. Table 3 in Appendix shows the specific scores for each state in each area evaluated as well as some general comments. The treatment of biological evolution in state science standards has improved dramatically over the last ten years. We consider this great news! Only Alabama dropped in the score for biological evolution. Other areas show less consistent trends in treatment. As noted above, treatment of human evolution is abysmal. Only seven states and the District of Columbia provide a comprehensive treatment of human evolution. Geological evolution and cosmology are also variously treated. In general, inclusion of geological evolution is better and more consistent than cosmology, which, if mentioned, is often left to high school. We found that many states introduce students to the earth, solar system, and even universe early on but do not reference the Big Bang as the current scientific theory for the origin of the universe. Discussion of the connection between biological, geological, and cosmological systems also varied across states; only 17 states provided a comprehensive treatment. In addition to scoring and grading each set of state standards, a few states merit further discussion, particularly because they provide excellent examples of the successes and failures of the standards-setting process. Florida and Kansas are stories of success. Louisiana and Texas are examples of how and where things can go very wrong and the implications for teachers. Hawaii provides an example of how even a failed antievolution campaign can do subtle damage to science standards. Finally, we draw attention to Minnesota and Colorado—two states currently revising standards. Over the past decade, Florida has improved its standards more dramatically than perhaps any other state. The 1999 standards received an F from Lerner (2000) for their (lack of) treatment of biological and geological evolution and scored zero in the Fordham Foundation’s 2005 report, “The State of State Science Standards.” As both reports observed, evolution was not even mentioned by name at the time. However, after several months of public discussion and debate, the Florida Department of Education’s writing committee developed a vastly superior set of standards in 2007. Biological evolution became prominent, human evolution was explicitly discussed, and geological and cosmological evolution were covered as well. In February 2008, after fierce creationist opposition, the Board of Education approved a revised version in which evolution was persistently referred to as “the scientific theory of evolution.” A similar label was used for plate tectonics, cell theory, atomic theory, and electromagnetism (this tactic of protecting creationist-opposed topics by textually grouping them with less “offensive” areas of science, in order to imply that all are equally legitimate, is also used in the Minnesota standards; we discuss below why we believe it may be largely ineffective). However, the standards also explicitly required that students be able to “recognize and explain that a scientific theory is a well-supported and widely accepted explanation of nature and is not simply a claim posed by an individual. Thus, the use of the term theory in science is very different than how it is used in everyday life.” This does an excellent job of heading off “just a theory”-style attacks on evolution, and Florida’s current standards score a solid A. No state illustrates the political vulnerability of science education more clearly than Kansas; the Kansas standards have seesawed between abysmal and excellent no fewer than four times in the last decade. In 1999, a creationist majority on the Board of Education systematically eliminated nearly every mention of biological, geological, and cosmological evolution from the standards, every reference to the age of the earth or universe, and even indirectly related material such as radiometric dating methods. Unsurprisingly, Lerner (2000) failed Kansas, calling their standards a “disgraceful paean to antiscience.” The public responded by ousting three supporters of the change, and in 2001, a largely new Board voted to restore evolution to the standards. However, a creationist majority returned to the Board in 2004 and, in 2005, approved a new set of standards. This time, the Board did not eliminate evolution but, rather, added a large amount of antievolution material themed around intelligent design. This included redefining science so as not to depend on “natural explanations,” characterizing evolution in particular as depending on an “unguided natural process,” attacking common descent, gradualism and abiogenesis, and invoking the ID concept of “irreducible complexity.” The makeup of the Board shifted again in 2006, to a pro-science majority, and the current standards were approved in early 2007. These are excellent overall, easily earning an A. Given Kansas’ history, we should be prepared for them to be altered again in the future. In each past episode, the combined efforts of activists, scientists’, and educators’ organizations at the local, state, and national levels were crucial to restoring good science standards, and doubtless, they will be again. The coverage of evolution in Louisiana’s state science standards is actually adequate and would have received a grade of C but for the Louisiana Science Education Act. Following the passing of the Louisiana Science Education Act, the Louisiana Board of Elementary and Secondary Education (BESE) was ordered to establish science education guidelines consonant with this act. These guidelines, passed in January 2009, state that BESE is to provide “support and guidance of teachers regarding effective ways to understand, analyze, critique, and objectively review concepts, laws, principles, and scientific theories.” To this end, teachers are permitted to use “supplemental textbooks and other instructional materials,” save for those prohibited by BESE after a lengthy and onerous review process. The Louisiana Department of Education proposed that these guidelines forbid “materials that teach creationism or intelligent design or that advance the religious belief that a supernatural being created humankind,” but BESE removed this caveat after objections by creationist organizations and the sponsor of the LSEA. The brief but adequate treatment of evolution in the state science standards is completely undermined by the LSEA, and the standards now score an F.
Notably, in the last standard mentioned, the Board removed a statement that the estimated age of the universe was 14 billion years; then-chairman Don McLeroy is a young-earth creationist who has stated that the Earth is about 6,000 years old. Given the loss and adulteration of content in the areas of cosmological and geological evolution and the profusion of creationist jargon, we cannot score Texas’ current standards as other than an F.
The Earth/Space Science standard, circa 2007, directs the student to “compare different theories concerning the formation of the universe.” Its sample performance standard elaborates, “The student: Compares the Big Bang Theory to another theory of the origin of the universe (includes supporting evidence for both theories and evidence that refutes the theories) and recommends which theory is more plausible.” A casual observer might view this reference to “another theory” as pointless but harmless; however, in an older (1999) science standards document, which is still available on the website of the Hawaii Department of Education with no indication of obsolescence, the glossary contains the entry “Evolution vs. creation: two approaches to help explain the origin of life; the former based on Darwin’s Theory of Evolution and the latter on divine intervention.” In 2001 the Hawaii State Board of Education debated whether to insert creationist language (invoking “multiple theories of origin”) into the section of the standards discussing evolution. This language was defeated, but we suggest that the above reference to “another theory of the origin of the universe” is a holdover from this earlier attempt to accommodate creationists. Minnesota’s standards have just been approved by the Minnesota Department of Education and are currently going through the legislative process for formal implementation. They earn a score of B, as they did in 2000, but this masks significant improvement; in particular, biological evolution is covered more thoroughly than it was before. Two problems prevent their score from rising from a high B to an A: Their coverage of cosmological evolution is nonexistent before the high school level, and they contain some creationist jargon, specifically the benchmark 9.1.1.7: “Explain how scientific and technological innovations ─as well as new evidence can challenge portions of, or entire accepted theories and models including, but not limited to: cell theory, atomic theory, theory of evolution, plate tectonic theory, germ theory of disease, and the big bang theory.” Minnesota science education advocates believe that this long-standing benchmark was not written by creationists but was presented as a compromise to forestall even worse “evidence against evolution” language. Thus, the benchmark is meant to imply that evolution, Big Bang theory and plate tectonic theory are just as well supported by evidence as cell theory, atomic theory and germ theory and that while evidence-based “challenges” to the former theories are not impossible, they are no more likely than valid challenges to the latter. However, students do not learn directly from this benchmark or from any other standard but rather from lessons and teaching materials permitted by the standards. This benchmark permits and indeed encourages creationist materials, which cast doubt on biological, geological and cosmological evolution. It is likely that creationist activists will push for these materials to be taught and will simply pay no attention to the part of the benchmark that refers to other theories. We therefore consider it to be a mild example of creationist jargon, as we define the term above, and we recommend that Minnesota educators and science advocates continue to watch their schools for signs of its abuse. Other than this issue and the lack of cosmological material in earlier grades, Minnesota’s standards are excellent. Colorado’s academic standards are currently undergoing overhaul; a draft of its science standards was released on May 1 for public comment. The science standards also earn a score of B, as they did in 2000. While mostly solid, Colorado continues to treat human evolution only implicitly, through broad statements such as, “Organisms are classified into a hierarchy of groups and subgroups based on similarities which reflect their evolutionary relationships” (Standard 3, Benchmark 14 for grades 9–12). It also makes no mention of the Big Bang whatsoever nor does it otherwise discuss the age and development of the universe. Lerner (2000) comments that Colorado received a D overall in the Thomas B. Fordham Institute’s The State of State Standards 2000, “mainly on the basis of its poor treatment of the physical sciences”; the lack of cosmological material may reflect this more general weakness. Colorado’s standards will be approved by the State Board of Education in December 2009; we encourage Colorado educators and interested citizens to follow the review and approval process at the Department of Education’s webpage. (http://www.cde.state.co.us/cdeassess/UAS/standardsreview.html). Questions and feedback can also be sent to the review committee staff at the Colorado Standards Review Home webpage. (http://coloradostandardsreview.wetpaint.com/). Get involved. Check to see when your state is next reviewing state standards, and ask your department of education or state educators’ associations how to participate in that process. Take a careful look at the language of your standards; check not only for explicit creationist claims but also for language that permits or encourages teaching material that makes such claims. Do not confine your attention to life science courses; check whether earth and space science courses discuss cosmological and geological evolution and whether human evolution is discussed in social studies or anatomy courses (as is sometimes the case). And make sure that the groundwork for all of these subjects is laid in K-8, rather than introduced for the first time in high school. Simon S. 2009. Texas opens classroom door for evolution doubts. The Wall Street Journal; March 7: A3. http://online.wsj.com/article/SB123819751472561761.html.